You can make a variation on the commonly seen small pearl tapioca pudding using the large pearl type, with some changes to preparation. This is a guide about making large pearl tapioca. How do I cook tapioca large pearls for tapioca pudding? I have always used the minute tapioca. 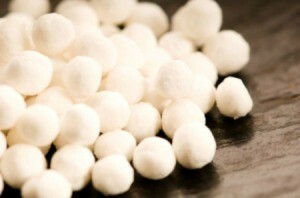 I would like to make the tapioca with the large pearls. Thank for your time and help. I used to make it, but have forgotten just how I did it. Think I used to soak it in the milk in the frig overnight, then cook it. Hope this will help you. The Amish-Mennonite Tapioca Pudding on this website uses Baby pearl. I would think if you heated then soaked the larger overnight then made the recipe it would work. Bring water to a boil. Add tapioca, cover and cook for 15 to 20 minutes or until most of the balls are clear. Remove from heat and add gelatin and sugar. Stir until sugar is dissolved. Place in refrigerator overnight. Fold in whipped cream and fruit, if used. Serves 12 to 15. Check the package. There will most likely be instructions and/or recipes there.